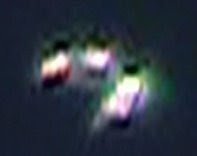 Attorney Sanchez Rosales, who is also a skywatcher, has continued to document the UFO phenomenon from his rooftop. On this occasion, he presents a very interesting video that shows a luminous object that appears to lack a defined shape. The recording was done on February 16, 2009 at 16:40 hours. b) It acquires a certain morphology that is hard to identify. Like the witness, our position is to maintain objectivity, as we know that objects seen at a distance may lead us to confusion. We believe that it may be a UFO, based on the foregoing descriptions. However, any opinion is valid at this point.